Emotional. But perhaps that doesn’t suffice to describe it. There was something different, perhaps deeper, more profound, in that intense and spontaneous applause that welcomed John Ellison on stage during the 10th Arco Rock Legends. Kay Rush, as usual the splendid host of these international sport climbing awards, welcomed him wearing her CAC – Climbers Against Cancer T-shirt. He, John, with his amazed and at the same time moved smile, watched the audience as it simply would not stop applauding. There was affection, sincere warmth in that applause, affinity. „I am one of you and it’s thanks to you that I’m here. This award belongs to everyone, we all received it“ said John. As if to say: I’m still here thanks to you, thanks to the energy you have given me. An energy that is symbolically represented by 25,000 CAC t-shirts and 500,000 euro raised, destined to various cancer research centers dotted across the five continents. John Ellison seemed happy when he received the Dryarn Climbing Ambassador by Aquafil award. Certainly the hundreds of spectators were who had come to watch the celebration at the Casinò di Arco. Happy and moved, as when one takes part in something, is united by a common cause. As when you here yes, that – as John says – „Everything that happens to you in life can be turned into an opportunity.” John has a difficult mountain to climb, the most difficult of all. He is dealing with it head on, with great courage and with an incredible smile. He’s also doing so a little bit for all of those who love him dearly. And it’s for this reason that the spectators feel so close to him, that the applause goes beyond emotions. And this is also why we, like so many others, wore our CAC t-shirts at the Casinò last night. A symbol in the climbing world that goes well beyond climbing. That T-shirt was also worn on stage by the the other Arco Rock Legends protagonists. 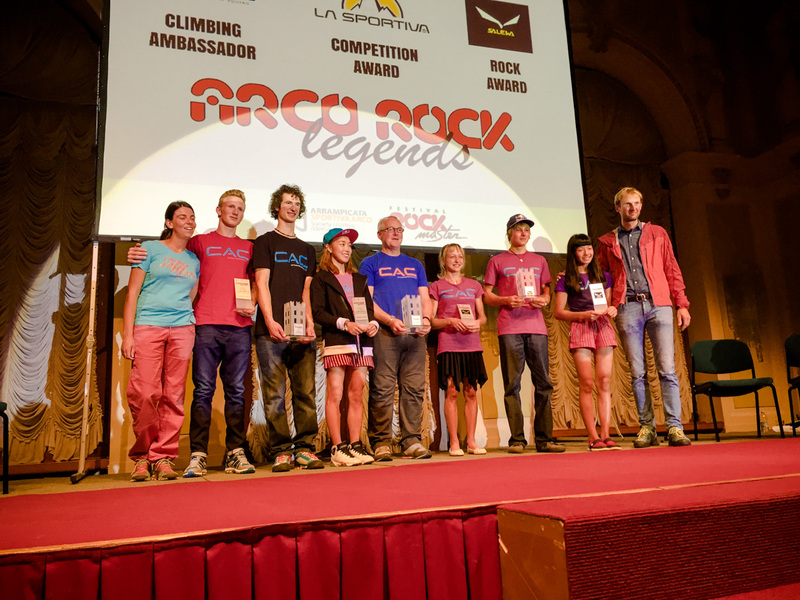 First and foremost Adam Ondra who this year, for the first time ever after having been nominated three times in the past, won the La Sportiva Competition Award, the prize that goes to last season’s best athlete. Not awarding him was practically impossible seeing that this absolute climbing ace, he who more than anyone else has transformed climbing over the last few years, won both the Bouldering and Lead World Championships. A hitherto unimaginable achievement. A thought shared – with his hallmark great fair play – by Austria’s Jakob Schubert, the absolute climbing champion who had been nominated for the award along with Ondra. And also by Jain Kim, the Korean World Lead Champion, winner of the 2015 lead World Cup and absolute climbing start, in Korea and elsewhere, who lit up the stage with her grace and simplicity. Simplicity combined with great power and class, thanks to which the other three nominees took the stage of the Salewa Rock Award, the sport climbing Oscar for achievements at the crags on boulder problems. This was illuminated by Angela Eiter, the incomparable Austrian champion who won everything there is to win climbing competitions, including the first-ever Salewa Rock Award in 2006, and who was now back in Arco for her great performance outdoors. Angela embodies this history of these Awards and is a shining example for all the young athletes who during the last 10 days, right here at Arco, have been taking part in the World Youth Championships. Just like 14-year-old American Ashima Shiraishi who recently won the Youth B Boulder Championship and who had been nominated for her stellar performance outdoors. Ashima is certainly predestined, an immense talent, a star who will shine brightly for many a year to come. But the Salewa Rock Award star that shone brightest this year was that of Alexander Megos, the 22-year-old German who, after three consecutive nominations, was finally honored for having explored new horizons. His climbing, fueled by imagination and happiness, has provided this sport with new and free visions. A message of freedom and happiness that perfectly joins those emotions, that go well beyond simple emotions, given to all of us by John Ellison.